ONE-OF-A-KIND. CUSTOM MADE. TELL YOUR STORY. Your high school class ring or jewelry captures what you want to remember most about high school. Your accomplishments, your friends, your memories, your goals and more. You design a ring that reflects your style, being a part of your class & your high school. A tangible symbol to push you to achieve your goals and a timeless keepsake that is always prestigious. Nothing else captures your memories so uniquely! Offer valid 3/13/18 - 3/19/18. $30.00 off your high school class ring order, restrictions apply. Orders using RINGMADNESS promo code. Offer not valid on Basic Wildcat ring, Tags, Lockets, Bracelets or Sarah Chloe. Call 1-800-JOSTENS or ask your representative for details. 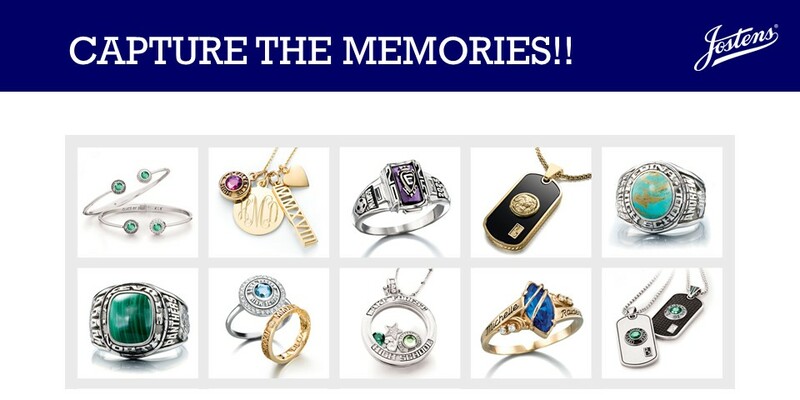 Your class ring or jewelry can capture your best moments of your hig school experience. Hundreds of styles and options to choose from truly make your creation a one-of-a-kind. Remember what you're most proud of for years to come! We offer a variety of payment options to make the design you want affordable. Choose from our automatic credit card installment plan (JPay) or an individual pay as you go plan that is completely custom to what works best for you. If you are simply looking to celebrate & remember being a part of your class and school's history, the Mascot ring is for you. This ring uses your school colored stone and features your school mascot and name on one side. The other side is the Education symbol with your graduation year date. Your initials are engraved on the inside.